Docx File Restore is a standalone application that offers recovery of document recovery for Office Word application 2007 and above versions. 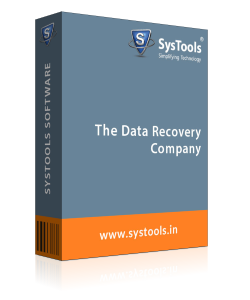 A guaranteed recovery is followed by a retentive conversion to a new output file. Perform the recovery of corrupt Docx files with Word 2010 recovery tool. Process documents corrupted on any level intensity. Recovery involves retrieving the text, graphics, and other contents that the document consisted of at the time of corruption. Once the Docx file is recovered, a preview of its contents is generated on software panel. You can have a look at the contents recovered to cross check the success of recovery and proceed with saving the file for continued use in future. Post recovering the Docx file, you can choose to save it for continued usage. The Docx 2010 restore software creates a new Docx format file that enables recreation of the document as part of saving the recovered file. If you don’t prefer storing the data back as a Docx file, the software lets you save the document as an RTF file. Select RTF instead of Docx to save the recovered contents of the document as a Rich Text Format file. Q. How can I eliminate the error ‘The file cannot be opened’? Ans: You can get the Word 2013 recovery tool. 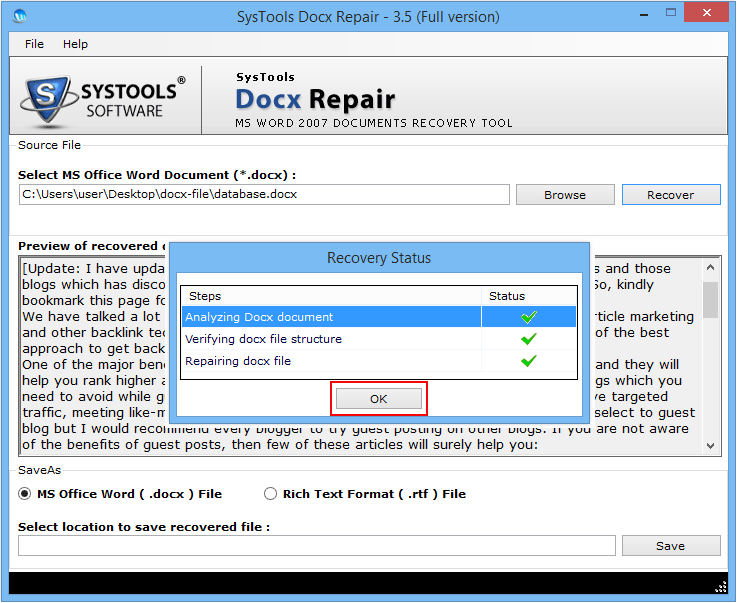 The software holds expertise at recovering Docx files, thus, you can recover the documents created using Word 2007, 2010, and 2013. It guarantees resolving all document corruption errors with successful results. Q. What to do if the Docx file becomes unreadable? 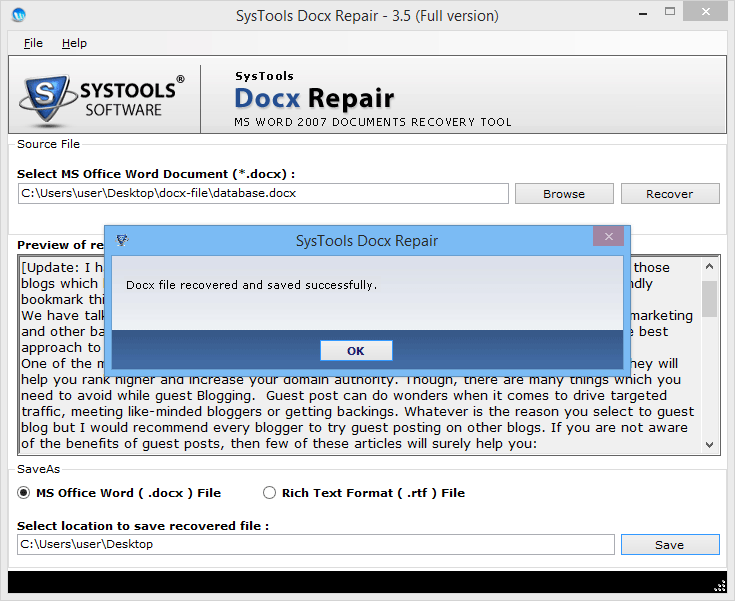 Ans: Docx 2007 restore tool is perfect for you if the document seems damaged. Garbage data is a serious sign of corruption in the document. 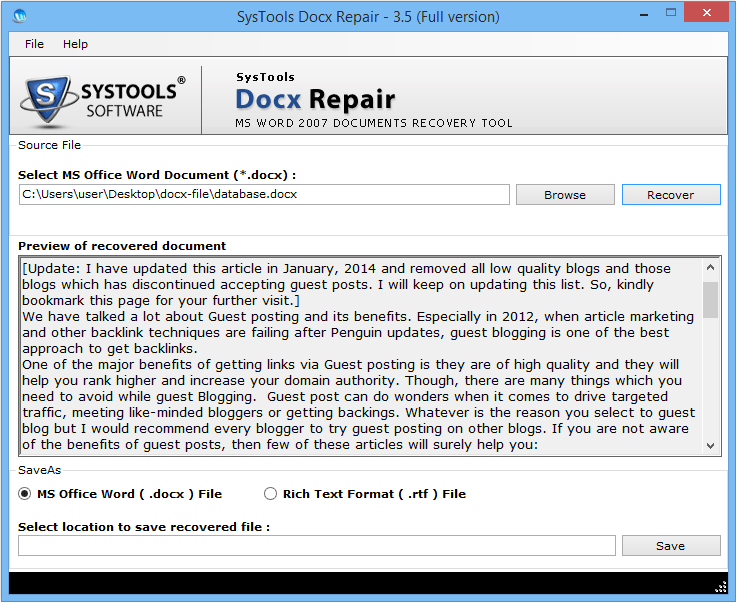 Use Docx recovery tool in order to make such documents readable via recovery. 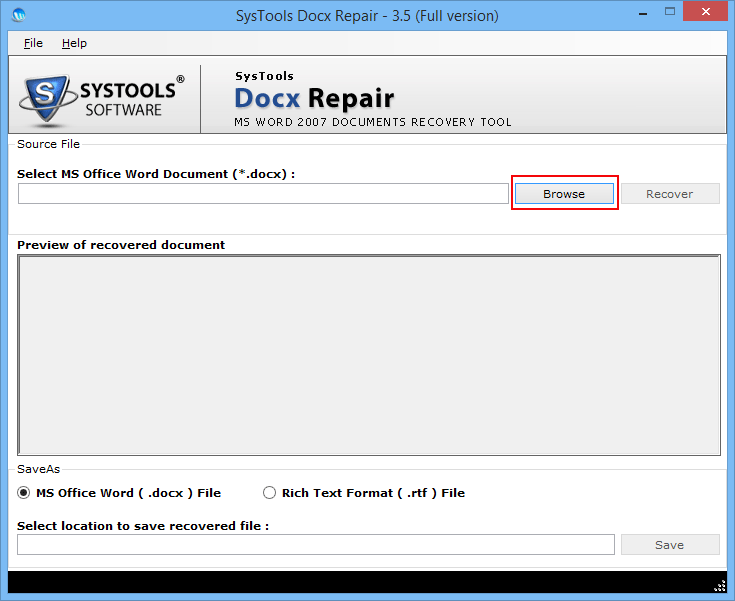 How to repair docx file? Step 1 : Firstly open DOCX Restore Software. 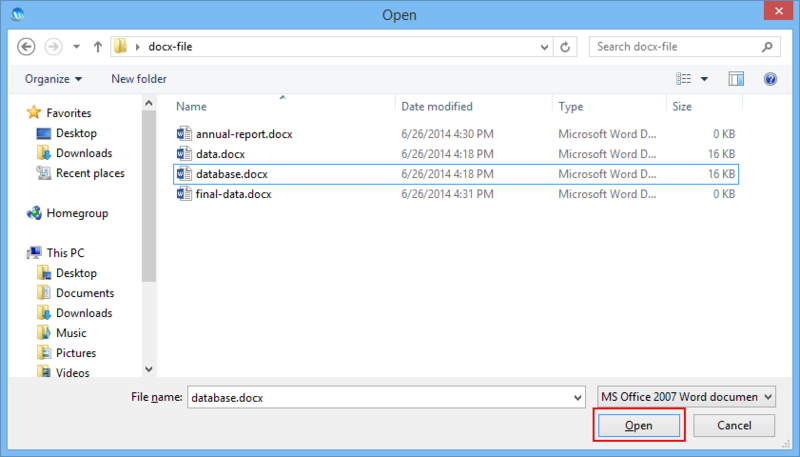 Step 2 : Go to browse option and choose the path of DOCX file and select the MS word file. 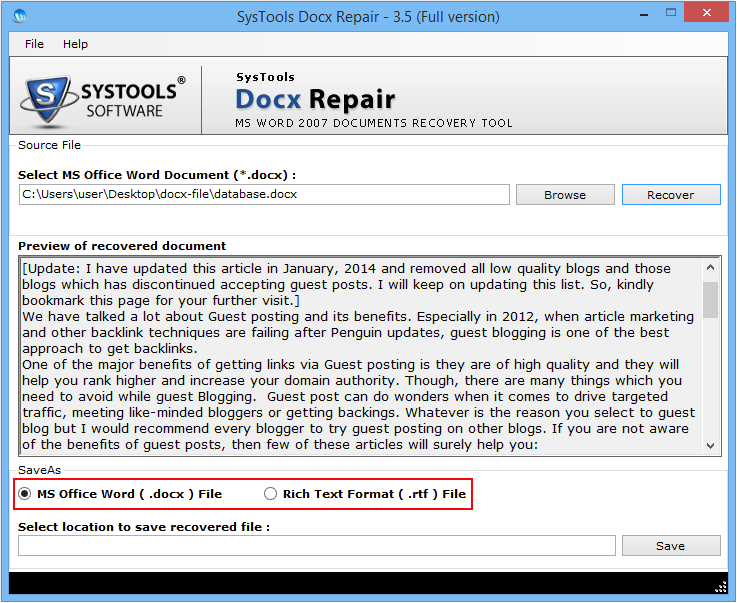 Step 3 : Select the MS DOCX file, which you want to recover and fix. Step 4 : Go to Recover option and click on it. Step 5 : Now, DOCX File Restore Software will start retrieving the DOCX file. It take less time to recover the MS word file. Step 6 : After completion of Scanning the files, the tool shows preview of the repaired DOCX file. Step 7 : This DOCX File Restore Tool allows to restore contents from DOCX file and Save it in two formats: (a) MS Office Word(docx) File and (b) Rich Text Format(RTF). After select the format, select the location to save the retrieve file. Step 8 : Select the RTF(Rich Text Format) to recovered the content of the damaged DOCX file can be transfer into an .rtf file format. Step 9 : Now select the location where you need to store the recovered the DOCX file. Step 10 : After competition of process, the docs restore tool gives you successfully message.